Football America UK stocks high quality football cleats and footwear from Nike, Under Armour, Reebok, Adidas and Riddell. 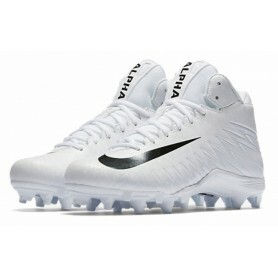 Whether you need speed, stability, comfort or the latest style cleats, we have the football cleats to fit you. Designed specifically for linemen, the Nike Force Savage Elite TD Men's Football Cleat features a wider cleat plate and an armoured toe box for the comfort and durability you need to dominate the trenches. Explode down the field with the Nike Men's Vapor Untouchable Varsity 3 TD Football Cleats, which have tough studs that deliver a powerful grip. The synthetic leather uppers and partial booties promote a light, secure feel, while the sock linings cushion your feet for comfort. Emulate your favourite player in the Alpha Menace Pro. A mesh and synthetic skinned upper with Flywire technology delivers a snug breathable fit, added durability and unmatched lock down while a three-quarter length Phylon wedge midsole provides maximum padding and a reduction in cleat pressure. The Nike® Alpha Menace Pro football cleat has a TPU plate with 3-sided studs that ensure superior traction, acceleration and multidirectional movement on every down. Leave the defense in the dust in the Vapor Speed II. A synthetic upper with Flywire cables wrapping the midfoot offers you a strong durable fit, a locked down feel and maximum support during lateral cuts. The Nike® Vapor Speed 2 TD football cleat has an Achilles pad that provides the cushioned comfort you’re looking for while a TPU speed plate with 13-cleat configuration delivers exceptional speed, traction and control during cutbacks and changes in direction. 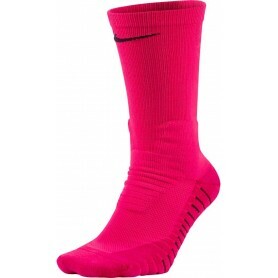 The Nike Vapor Crew Men's Football Socks help keep your feet comfortable and protected from impacts on the gridiron with zoned cushioning and strategically placed padding. The Nike 2.0 Elite Vapor Crew Football Socks help keep your feet comfortable and protected from impacts on the gridiron with zoned cushioning and strategically placed padding.